Udrive, the pay-per-minute car rental app, has just launched some handy new features which make affordable, short-term driving even flashier. 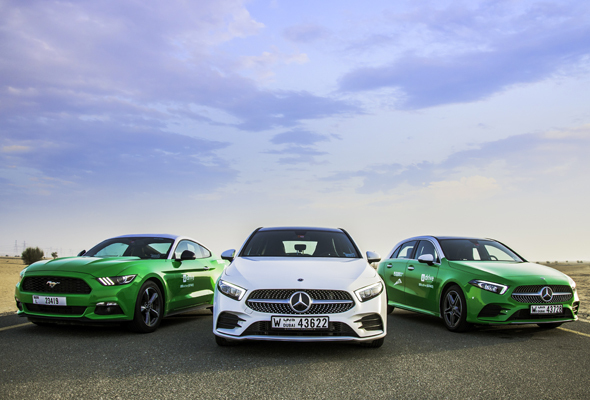 The launch of Udrive Premium Cars means you can now rent a Mercedes-Benz A-Class and Ford Mustang for 70 fils per minute, or Dhs279 per day. Flashy. This is inclusive of fuel, parking, insurance and 200km allowance per day. This adds to the existing fleet of Nissan Tiida and Kia Picanto cars, which are priced at 60 fils per minute or Dhs144 per day, and Toyota Yaris, Peugeot 208, Nissan Sunny, Ford EcoSport, Ford Figo, Chevrolet Spark and Chevrolet Aveo which cost 70 fils per minute or Dhs168 per day. Not heard of Udrive? Well, you’ve probably seen their bright green cars dotted around the city. Launched in January 2017, the car rental app allows users to book a car for their journey via the dedicated Udrive app or website, then find the car at a location that’s convenient for them, and simply drive off. Udrive charges users per minute, and allows you to park it wherever you like once your journey is complete. Users don’t need to pay for petrol, insurance of the majority of public parking, meaning it’s become one of the city’s more affordable options for short-term car rental.